The bus industry in South Africa has for many years made a vital contribution to the economic and social development of the country. As a provider of bus services it has and continues to provide mobility to millions of people who are dependent on public transport, for example, learners who require transport to and from school, workers who require transport to and from their jobs, and individuals who are seeking employment or access to hospitals and other services. SABOA is the credible voice of an inclusive, efficient, sustainable and transforming bus industry, which plays a pivotal role in an integrated transport system through safe, reliable and affordable bus services that add value and is attractive to our stakeholders. The last year has been marked by a significant growth in the passenger base of the industry as well as the number of buses sold. This is ascribed to the increase in economic activity in the country, generally improved service quality in the industry and some passenger cross-elasticity between the taxi industry and the bus industry. The 2010 requirements for public transport have also renewed the focus on a sustainable dependable public transport system. The Department of Transport has published a number of strategy documents in support of a larger role for public transport in the future South Africa. The role of the bus in urban transit in South Africa is entirely underestimated. The major concern remains the ability to fund public transport services. With the increasing cost of fuel and increasing levels of congestion in especially our urban areas, people will increasingly turn to public transport and the trends are already evident. Available statistics indicate that 80 per cent of South Africa’s population is totally dependent on public transport (bus, commuter rail and taxis) for its mobility needs. The 2010 FIFA Soccer World Cup provides a much needed impetus to get things moving and to inject a sense of urgency and focus. The Department of Transport undertook a review of the public transport systems and this process would culminate in the development of a public transport strategy. The Minister of Finance indicated during his budget speech that investment in public transport, which are made in partnership with cities are already beginning to reshape the urban landscape and are modernizing public transport arrangements. He emphasized that these reforms should go well beyond the requirements for 2010, and should be central to the modernization and sustainability of our urban environment and for this purpose the public transport infrastructure systems grants includes R11 billion for these programmes over the next three years. This will help these cities to move with speed in implementing integrated rapid public transport networks and aligning to the Public Transport Strategy. Integrated fare structure through a common fare system on all modes on the network. Integrated rapid public transport service networks are the mobility of the future and are the best viable option that can ensure sustainable, equitable and uncongested mobility in cities. It provides mobility solution that is attractive to both current public transport users as well as current car users. The successful implementation of these networks in the targeted 12 cities and 6 rural district municipalities will see improvement in public transport service for potentially over half of the country’s population. The transport by the luxury coach sector of tourists in South Africa has an excellent safety record underpinned by regulatory standards and operating procedures. The safety record of this sector is therefore comparable to the best in the world. South Africa is renowned as having amongst the best quality national road networks in the developing world. All of the major tour operators into South Africa have stringent conditions that they apply in the selection of companies to operate transport services. Safety is the number one issue in these policies. The top luxury coach operators in the charter tourism market all have a policy where safety is non-negotiable. Safety policy in all cases covers the full range of issues involved in safety. The Department of Transport conducted a survey of safety policy in these companies in September 1999 and found that all companies comply with regulatory requirements, and in many areas operate at levels above the regulatory minimum. The driver must have passed both the practical and theoretical components of the standard "K53" testing which is comparable to the best in the world. The driver is required to be in possession of a Professional Driver Permit, which is renewed every two years subject to passing the specified test and a medical examination. In general terms, company policies in the bus industry require additional compliance specifying levels of experience, background checks, personal road safety records, and ongoing positive performance evaluation and training. Rivalry and mistrust between bus and taxi operators and intimidation which is prevalent in the taxi industry remains a challenge for government and traffic authorities. Government and the bus industry have been co-operating over a number of years in setting the technical standards for all aspects of bus construction and components. These standards are established in Road Traffic legislation, regulations and through the manufacturing standards system regulated by the South African Bureau of Standards. They are monitored and up-dated based on the findings of accident investigations. Recent additions to the standards include specifications regarding roll-over protection as well as well as for the construction and anchoring of bus seats. Steering, braking and tyre standards are amongst the specific focus areas within the testing process. In addition to pre-trip safety checks, safety procedures require drivers to conduct safety checks on all vehicles during a journey. All of the top tour operators have as standard equipment on buses cellular communication equipment, on-board computers and retarder systems that control bus speed at safe levels in downhill situations. This is exciting times for the bus industry. 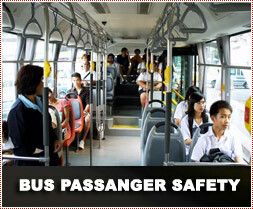 It is expected that the bus industry will play a pivotal role in public transport towards 2010. The safety of commuters will be paramount and bus operators will be monitored closely by transport authorities. The authorities have already warned both drivers and owners of public transport vehicles, especially the bus and taxi industry to take responsibility for the safety of their passengers. One bus or taxi crash can result in many deaths and several injuries and no mercy will be shown to any driver or owner who breaks the law.